Genesis Sonic & Knuckles (USA) "Knuckles" in 11:57.29 by Qwerty. Sonic & Knuckles is the fourth game in the Sonic series. It retains the same basic features as in the previous Sonic games (speed, rings for protection, Special Stages with Chaos Emeralds) as well as the three different shield types introduced in Sonic 3 (Fire, Water and Electric). Players can select either of the two title characters for play - either Sonic, or the all-new Knuckles the Echidna. Knuckles cannot jump as high as Sonic, but he can glide by holding the jump button while in the air. 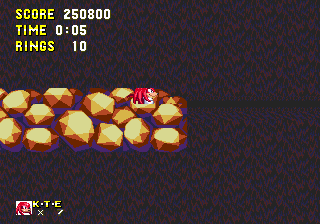 If you glide into a wall, Knuckles will also be able to climb it. He can also break through walls that Sonic can't. With these abilities, Knuckles can access different areas from Sonic, making for each level an entirely new experience.